This is Part 2 of a multi-part series. Click here for Part 1. Here is another resource for you, and best of all, it’s free. 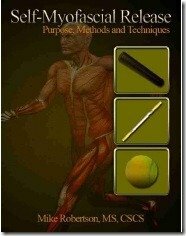 It’s called Self-Myofascial Release: Purpose, Methods, and Techniques by Mike Robertson. Elite athletes have the luxury of having their physiotherapist or massage therapist on site at practice as well as accompanying them at track meets. Others don’t have that luxury, especially during the warm up. If that is the case, then a foam roller is all you need. Below is an expert of the book. Click here to download (or right click and choose “save as”) the entire book (PDF, 1.56 Mb, 47 pages). It’s an excellent resource. Foam rolling is quickly becoming a staple in training programs worldwide. From elite athletes to weekend warriors, you can walk into many training facilities and see people using a foam roller as part of their regimen. What benefits are derived from foam rolling? When is the best/most optimal time to foam roll? Can foam rolling replace other soft-tissue therapies? While I don’t claim to have all the answers, I do hope to teach you the basics of self-myofascial release, along with ways you can integrate it into your current training regimen to elicit improved results. “Foam Rolling” delivered seven results, none of which applied to using foam rollers as an SMR technique. “Foam Roller” delivered six results, none of which applied to using foam rollers as an SMR technique. “Self Myofascial Release” delivered three results, none of which applied to using foam rollers as an SMR technique. Lack of good research is quite the conundrum, as it forces us to theorize and speculate on the perceived effects of any medium. The first question I get when showing someone how to foam roll is, “Why am I doing this?” If you’ve ever performed SMR on yourself, you know the first couple of times are generally quite uncomfortable! Self-myofascial release (SMR) using a foam roller or other implement is possible thanks to the principle known as autogenic inhibition. While you’ve probably never heard of your golgi tendon organ (GTO) before, it’s the key ingredient that makes foam rolling effective. The GTO is a mechanoreceptor found at the muscle-tendon junction; for lack of a better description, it tells us the level of tension within the muscle/tendon group. 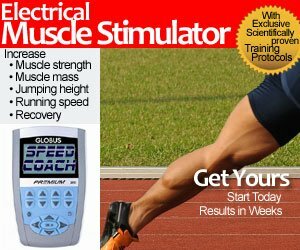 When tension increases to the point of high risk of injury (e.g., tendon rupture), the GTO stimulates muscle spindles to relax the muscle in question. This reflex relaxation is autogenic inhibition. The muscle contraction that precedes the passive stretch stimulates the GTO, which in turn causes relaxation that facilitates this passive stretch and allows for greater range of motion. With foam rolling, you can simulate this muscle tension, thus causing the GTO to relax the muscle. Essentially, you get many of the benefits of stretching and then some. It’s also fairly well accepted that muscles need to not only be strong, but pliable as well. Regardless of whether you’re a bodybuilder, strength athlete, or ordinary weekend warrior, it’s important to have strength and optimal function through a full range of motion. While stretching will improve the length of the muscle, SMR and massage work to adjust the tone of the muscle. Traditional stretching techniques simply cause transient increases in muscle length (assuming that we don’t exceed the "point of no return" on the stress-strain curve, which will lead to unwanted deformities). SMR, on the other hand, offers these benefits and the breakdown of soft-tissue adhesions and scar tissue. One need not look any further than the overwhelmingly positive results numerous individuals have had with Active Release Techniques (ART) or other deep-tissue modalities to recognize the value of eliminating adhesions and scar tissue. Unfortunately, from both a financial and convenience standpoint, we can’t all expect to get ART or massage done on a frequent basis. SMR on the foam roller offers an effective, inexpensive, and convenient way to both reduce adhesion and scar tissue accumulation, and eliminate what’s already present on a daily basis. Just note that like stretching, foam rolling doesn’t yield marked improvements overnight; you’ll need to be diligent and stick with it (although you’ll definitely notice acute benefits). READ Foam Roller Exercises to Strengthen Hamstrings? To read the rest of the book, click here to download (or right click and save as) the entire book (PDF, 1.56 Mb, 47 pages). Don’t forget the usefulness of SMR as a diagnostic tool. It can point to local ‘knots’ that you were completely unaware of. If we think of ourselves as animals, SMR is our way of self grooming. Continues use improves circulation that promotes health supple tissue. When our muscle tissue is health it tells the brain that we are strong and health, we are able to hunt and gather, making us health to procreate. The brain then releases more hormones like testosterone increasing our vitality. Not much is known medically about SMR, but its clear to me that it is the future in preventative health care.